The Federal Aviation Administration has approved a launch license for SpaceX’s Falcon Heavy rocket set for blastoff Tuesday, giving the U.S. government’s regulatory green light for the heavy-lifter to dispatch Elon Musk’s used electric sports car on a one-way trip into deep space. Dated Feb. 2, the FAA launch license clears a final regulatory hurdle for the Falcon Heavy’s test launch from pad 39A at NASA’s Kennedy Space Center in Florida. The launch window Tuesday opens at 1:30 p.m. EST (1830 GMT) and extends until 4 p.m. EST (2100 GMT). The official weather forecast issued Sunday by the U.S. Air Force’s 45th Weather Squadron predicts an 80 percent chance of favorable conditions during Tuesday’s launch window. Made up of three rocket boosters derived from SpaceX’s Falcon 9 launcher, the triple-core Falcon Heavy will produce more thrust than any rocket currently flying, and the most by any vehicle since the space shuttle. SpaceX plans to boost the electric car with enough speed to escape the bonds of Earth’s gravity, steering the Roadster on a “hyperbolic” trajectory away from the planet into a heliocentric orbit around the sun. The orbit will take the automobile as far as the distance of Mars. The Tesla Roadster weighs about 2,760 pounds (1,250 kilograms), measures nearly 13 feet (3.9 meters) long and spans about 5.7 feet (1.7 meters) wide, according to Car and Driver magazine. Photos of the Tesla Roadster released by SpaceX show it dwarfed by the size of the launcher’s clamshell-like payload shroud, which extends 43 feet (13.1 meters) tall and 17 feet (5.2 meters) in diameter. SpaceX claims the Falcon Heavy can haul 140,660 pounds (63,800 kilograms) into low Earth orbit a few hundred miles up, up to 37,040 pounds (16,800 kilograms) to Mars, or 7,720 pounds (3,500 kilograms) to Pluto. A Falcon Heavy mission sells for around $90 million, the company says on its website. Those numbers assume SpaceX will not recover any of the Falcon Heavy’s boosters. The fuel reserve required for landings will diminish the rocket’s performance. For comparison, the Delta 4-Heavy rocket, operated by SpaceX rival United Launch Alliance, can haul up to 63,471 pounds (28,790 kilograms) to a low-altitude orbit approximately 120 miles (200 kilometers) above Earth when launched to the east from Cape Canaveral, according to a launch vehicle data sheet published by ULA. The Tesla Roadster’s weight and dimensions fall well under the Falcon Heavy’s capacity, and would not stress the lift capability of SpaceX’s smaller, single-core Falcon 9 rocket or Atlas, Delta and Ariane boosters operated by rivals United Launch Alliance and Arianespace. Musk said the midnight cherry red Tesla Roadster, which sells for $200,000 brand new, will be playing David Bowie’s iconic hit “Space Oddity” as it soars into the cosmos. Whimsical passengers are nothing new for SpaceX. 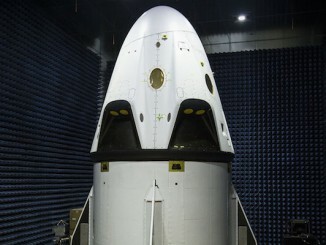 The company’s first Dragon capsule test flight carried a wheel of cheese to Earth orbit and back, a nod to a “Monty Python” comedy sketch. The restrictions of interplanetary travel, which require precise alignments between the planets, will keep the Roadster well away from Mars, assuaging concerns that the car could inadvertently crash into the red planet. The license requires SpaceX to hold $110 million in third-party liability insurance — or “otherwise demonstrate financial responsibility” — to cover property damages from a potential launch accident, roughly two to three times the FAA’s insurance requirement for a Falcon 9 launch from pad 39A. SpaceX must also hold $100 million in government property insurance, along with $72 million to cover claims from damage incurred during Falcon Heavy pre-flight operations at the Kennedy Space Center. Most of the FAA’s commercial launch licenses are granted for missions with destinations in Earth orbit, but the Falcon Heavy’s is not the first for a flight departing the planet entirely. An Athena rocket launched under the FAA’s licensing authority in 1998 with the Lunar Prospector probe sent to orbit the moon, and a United Launch Alliance Atlas 5 rocket launched into polar orbit under FAA oversight in 2016 with a commercial Earth observation satellite, then the Atlas 5’s Centaur upper stage reignited to head on an Earth escape trajectory into heliocentric orbit. NASA and U.S. military payloads riding on ULA and SpaceX rockets, such as Mars rovers and other interplanetary probes, do not need an FAA launch license. But going into Tuesday’s test flight, only three Falcon Heavy missions are confirmed in SpaceX’s backlog after the test launch: Two for commercial telecom companies Arabsat and ViaSat, and one for the Air Force. Another company, Inmarsat, has an option to launch a future satellite on a Falcon Heavy. 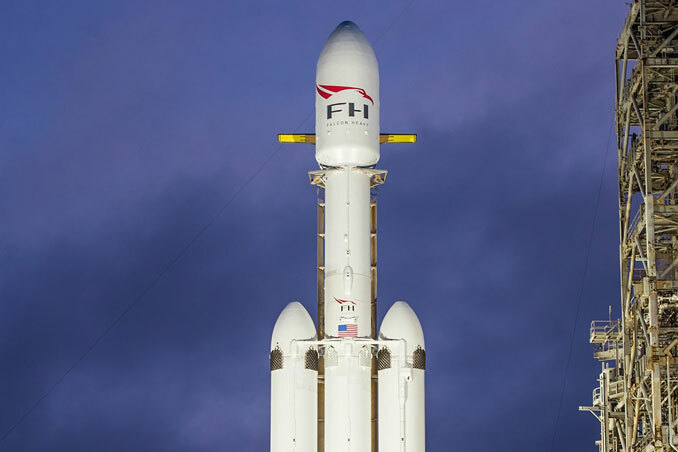 Some customers that reserved launches on SpaceX’s Falcon Heavy rocket switched their satellites to the smaller Falcon 9, which benefited from multiple thrust and performance upgrades to carry some payloads that originally required the triple-core rocket. Inmarsat and Intelsat had planned launches on the Falcon Heavy, but both ended up flying their satellites on the Falcon 9. The ViaSat 2 satellite built to provide high-speed Internet access across the United States was supposed to launch on a Falcon Heavy, but the firm move its launch to a European Ariane 5 rocket, citing schedule worries. ViaSat retained its contract with SpaceX to launch a future satellite on a Falcon Heavy. Powering off the launch pad with 4.7 million pounds of thrust from 27 Merlin main engines, the Falcon Heavy will head to the east from Florida’s Space Coast on a trajectory arcing over the Atlantic Ocean. Its two side boosters — modified Falcon 9 rocket cores recovered after previous launches — will shut down and fall away a couple of minutes into the flight. The side-mounted rockets will fire cold-gas nitrogen thrusters to flip around and fly tail-first, before reigniting to head for automated touchdowns at SpaceX’s landing complex at Cape Canaveral Air Force Station around 9 miles (13 kilometers) south of pad 39A. Twin sonic booms will crack across the spaceport as the boosters return to Cape Canaveral for staggered landings, slowed with the help of rocket thrust. The rocket’s center core, stiffened to withstand the extra loads of a Falcon Heavy launch, will head for touchdown on SpaceX’s drone ship positioned downrange in the Atlantic Ocean.. The Falcon Heavy weighs more than 3.1 million pounds (1.4 million kilograms) fully loaded with kerosene and liquid oxygen propellants. Most of that propellant weight will be consumed in the first few minutes of the flight. Tuesday’s launch promises to put on a spectacular show for spectators at the Florida spaceport. The Falcon Heavy’s ground-shaking thrust, coupled with the untried dual landings, should make for a memorable one-two punch for rocket geeks gathered on beaches and causeways surrounding Cape Canaveral. The Falcon Heavy’s long road to liftoff turned out to be a bigger challenge than expected, and Musk has done his best to downplay expectations. A critical hotfire test Jan. 24 was the first time all 27 of the Falcon Heavy’s engines ignited together. SpaceX does not have a test stand at its Central Texas development site to support such a high-thrust firing. 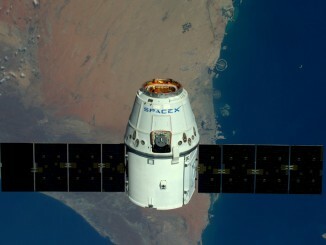 “This is one of those things that’s really difficult to test on the ground,” Musk said in July. “We can fire the engines on the ground, and we can try to simulate the dynamics of having 27 instead of nine booster engines, and the airflow as it goes through transonic (as it exceeds the speed of sound). It’s going to see heavy transonic buffet. How does it behave at Max-Q (maximum dynamic pressure)? 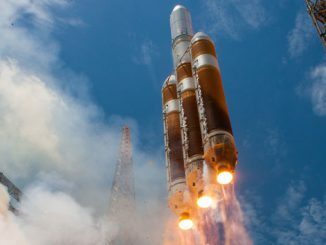 The energy generated by the Falcon Heavy’s 27 main engines will eclipse the 2.9 million pounds of thrust produced by the European Ariane 5 rocket, the current world leader in liftoff thrust, and will put out more than double the power of a United Launch Alliance Delta 4-Heavy launcher at liftoff. Overall, the Falcon Heavy is slated to produce the fourth-highest thrust level of any rocket in history, surpassed by the Soviet Union’s N1 moon rocket, which never had a fully successful launch, NASA’s Apollo-era Saturn 5 launcher, the Russian Energia rocket and the space shuttle.